This HOWTO intends to show how to use the BioPerl Tree objects to manipulate phylogenetic trees. It shows how to read and write trees, query them for information about specific nodes or overall statistics, and create pictures of trees. Advanced topics include discussion of generating random trees and extensions of the basic structure for integration with other modules in BioPerl. See the list of tree formats for details on each format. Generating and manipulating phylogenetic trees is an important part of modern systematics and molecular evolution research. The construction of trees is the subject of a rich literature and active research. This HOWTO and the modules described within are focused on querying and manipulating trees once they have been created. The data we intend to capture with these objects concerns the notion of Trees and their Nodes. A Tree is made up of Nodes and the relationships which connect these nodes. The basic representation of parent and child nodes is intended to represent the directionality of evolution. This is to capture the idea that some ancestral species gave rise, through speciation events, to a number of child species. So, it means that a Bio::Tree::Tree object is rooted tree. If you work with unrooted trees, do not forget to root them before loading to Bio::Tree::Tree object. The data in the trees need not be a strictly bifurcating tree (or binary trees to the computer science types), and a parent node can give rise to 1 or many child nodes. In practice there are just a few main objects, or modules, you need to know about. 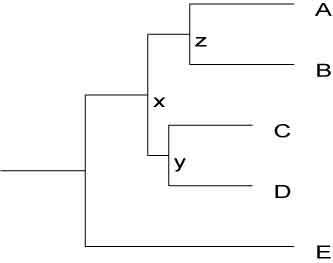 There is the main Tree object Bio::Tree::Tree which is the main entry point to the data represented by a tree. A Node is represented generically by Bio::Tree::Node, however there are subclasses of this object to handle particular cases where we need a richer object (see Bio::PopGen::Simulation::Coalescent for more information). The connections between Nodes are described using a few simple concepts. There is the concept of pointers or references where a particular Node keeps track of who its parent is and who its children are. A Node can only have 1 parent and it can have 1 or many children. In fact all of the information in a tree pertaining to the relationships between Nodes and specific data, like bootstrap values and labels, are all stored in the Node objects while the Bio::Tree::Tree object is just a container for some summary information about the tree and a description of the tree’s root node. Trees are used to represent the ancestry of a collection of taxa, sequences, or populations. Using Bio::TreeIO one can read trees from files or datastreams and create Bio::Tree::Tree objects. This is analogous to how we read sequences from sequence files with Bio::SeqIO to create BioPerlsequence objects which can be queried and manipulated. Similarly we can write Bio::Tree::Tree objects out to string representations like the Newick or New Hampshire which can be printed to a file, a datastream, stored in database, etc. The main module for reading and writing trees is the factory module which has several driver modules which plug into it. These drivers include Bio::TreeIO::newick for New Hampshire or Newick tree format, Bio::TreeIO::nhx for the New Hampshire extended tree format from Sean Eddy and Christian Zmasek as part of their RIO, Forrester and ATV system RIO,ATV,SDI , and for the phyloxml tree format. The driver Bio::TreeIO::nexus supports parsing tree data from PAUP’s Nexus format. However this driver currently only supports parsing, not writing, of Nexus tree format tree files. There are also modules for lintree tree format and Pagel tree format for writing these formats out. to Bio::TreeIO and it will automatically move the ids over to the bootstrap slot. This is only valid for the Nexus and Newick tree formats. An additional function was written to do this work in Bio::Tree::TreeFunctionsI called move_id_to_bootstrap which will do this work for you as well. Call it on a Bio::Tree::Tree object. Here is some code which will read in a Tree from a file called “tree.tre” and produce a Bio::Tree::Tree object which is stored in the variable $tree. Once you have a Tree object you can do a number of things with it. These are all methods required in Bio::Tree::Tree. For example try these two difference example scripts that read in a tree data and prints out the the node ids and bootstrap values. The first example is just the default behavior that assumes that internal node ids are Ids and not bootstrap values. In the second example we have told the TreeIO parser to automatically move the bootstrap values over from the internal node Ids. One can also explictly invoke this by calling just calling the move_id_to_bootstrap method on a tree. Request the taxa (leaves of the tree). Get the total length of the tree (sum of all the branch lengths), which is only useful if the nodes actually have the branch length stored, of course. An additional interface was written which implements utility functions which are useful for manipulating a Tree. Find a particular node, either by name or by some other field that is stored in a Node. The field type should be the function name we can call on all of the Nodes in the Tree. If you would like to do more sophisticated searches, like “find all the nodes with bootstrap values better than 70”, you can easily implement this yourself. Remove a Node from the Tree and update the children/ancestor links where the Node is an intervening one. This function does not preserve branch lengths. To preserve the branch lengths between the children and ancestor of the removed Node, you can use splice with -preserve_lengths=>1. # this will remove all nodes with an id() of '1'. Get the lowest common ancestor for a set of Nodes. This method is used to find an internal Node of the Tree which can be traced, through its children, to the requested set of Nodes. It is used in the calculations of monophyly and paraphyly and in determining the distance between two nodes. The above works for 2 or more nodes. Get the distance between two nodes by adding up the branch lengths of all the connecting edges between two nodes. Perform a test of monophyly for a set of nodes and a given outgroup node. This means the common ancestor for the members of the internal_nodes group is more recent than the common ancestor that any of them share with the outgroup node. Please notice that a test of monophyly is applicable for rooted trees only. Perform a test of paraphyly for a set of nodes and a given outgroup node. This means that a common ancestor ‘A’ for the members of the ingroup is more recent than a common ancestor ‘B’ that they share with the outgroup node and that there are no other nodes in the tree which have ‘A’ as a common ancestor before ‘B’. Please notice that a test of paraphyly is applicable for rooted trees only. Re-root a tree, specifying a different node as the root (and a different node as the outgroup). is_Leaf - boolean as to whether or not this Node is a Leaf or tip of the tree. each_Descendent - retrieve all immediete children from a node. height - Longest distance from this node to tip of the tree based on branch length. depth - Longest distance from this node to the root of the tree based on branch length. You can also make images of trees. If you have the module SVG::Graph installed you can create an SVG image of your tree. The example below uses TreeIO to get a Tree object and then its tree is written to an image file. An even better way to draw trees is implemented in Bio::Tree::Draw::Cladogram which will draw a cladogram in postscript format. The postscript file can be converted to SVG, PDF which can also be rendered in PNG, JPEG, and other image file formats. Bio::Tree::Draw::Cladogram does depend on the external module PostScript::TextBlock. Here is a simple script that writes out a postscript file for every file ending in .tre in a directory. It assumes the files are in Newick tree format but can be switched to Nexus tree format (like what you get out of a MrBayes run) if ‘newick’ is replaced with ‘nexus’ in the code below. The -bootstrap => 1 option specifies that internal id values should be written out - currently it assumes id is stored in the id() field so you will have to copy the values from the bootstrap() field if they are stored there. The -compact => 0 option specifies that branch lengths should be written (so this is actually a phylogram), -compact => 1 would instead draw a cladogram with equal branch lengths for all branches. There are many applications available to build phylogenetic trees. You can also build a tree using Bioperl alone. Pairwise distances for all sequences in an alignment can be computed with Bio::Align::DNAStatistics and Bio::Align::ProteinStatistics. There are several different methods implemented. For DNA alignments, Jukes-Cantor JukesCantor69 , Jukes-Cantor uncorrected, Kimura 2-parameter Kimura80 , Felsenstein felsenstein81 , Tajima-Nei TajimaNei84 , JinNei JinNei90 , and Tamura Tamura92 are currently implemented. In addition, for coding sequences, synonymous and non-synonymous counts can be computed with the bp_pairwise_kaks.pl. For Protein sequences alignments only Kimura Kimura93 is currently supported. To use these methods simply initialize a statistics module, and pass in an alignment object (Bio::SimpleAlign ) and the type of distance method to use and the module will return a Bio::Matrix::PhylipDist matrix object of pairwise distances. The code example below shows how this could be done. Given the matrix of pairwise distances one can build a phylogenetic tree using 2 methods provided in the Bio::Tree::DistanceFactory. Simply request either Neighbor-Joining (NJ) trees or Unweighted Pair Group Method with Arithmetic (UPGMA) clusters. There are caveats with these methods and whether or not the distances are additive. The method check_additivity in Bio::Tree::DistanceFactory is provided to calculate whether or not additivity holds for the data. The following is a basic code snippet which describes how to use the pairwise distance and tree building modules in BioPerlstarting with a DNA alignment file from clustalw. Note that there is also a Bio::Align::ProteinStatistics module. Non-parametric bootstrapping is one method to test the consistency of the data with the optimal tree. A set of subreplicates are generated from the alignment using the method from Bio::Align::Utilities called bootstrap_replicates(). One passes in an alignment object and the count of the number of replicates to generate. Once trees have been generated for each replicate, the bootstrap support for the optimal tree can be assesed with the assess_bootstrap() function in Bio::Tree::Statistics. It is possible to generate random tree topologies with a BioPerl object called Bio::Tree::RandomFactory. The factory only requires the specification of the total number of taxa in order to simulate a history. One can request different methods for generating the random phylogeny. At present, however, only the simple Yule backward is implemented and is the default. The trees can be generated with the following code. You can either specify the names of taxa or just a count of total number of taxa in the simulation. For more reading and some references for the techniques above, see these titles. J. Felsenstein, “Infering Phylogenies” 2003. Sinauer and Associates. D. Swofford, Olsen, Waddell and D. Hillis, “Phylogenetic Inference” 1996. in Mol. Systematics, 2nd ed, 1996, Ch 11. Eddy SR, Durbin R, Krogh A, Mitchison G, “Biological Sequence Analysis” 1998. Cambridge Univ Press, Cambridge, UK. JukesCantor69 Jukes TH and Cantor CR. “Evolution of Protein Molecules”, in Mammalian Prot. Metab., III, 1969, pp. 21-132. Kimura93 Kimura, M. “The Neutral Theory of Molecular Evolution.” Cambridge University Press, Cambridge, UK. 1993.